In the early 1850’s a man by the name of Lorenzo L. Langstroth developed the beehives that are used by 90 percent of American beekeepers today. Lorenzo was born in Philadelphia and later was a congregational minister. He had a life long hobby and interest in bees. Hives with detachable frames in which bees could construct combs existed in Langstroth's era. The bees tend to seal up any area around the frames with combs and a muggy, gumlike material identified as propolis, or bee glue, which bees produce from plant resins. As a consequence, the frames became glued in place and honey could only be harvested with significant problems. Langstroth's enormous gift was the finding that if the frames were divided from each additional frame and from the sides of the hive by a space of about 5/16 in. Just adequate room for a solitary bee to pass through, the bees would leave the gap free. The finding of this key aspect called beespace, permitted him to invent a hive with frames that nearly never had to be cut free in order to take the frames out. Harvesting and honey and inspecting the hives made it enormously easy to manage. Hives consist of open boxes called suppers. Suppers is acontraction of the word superhive, in which the frames are hung from the side. Extra super are added to the hive when more space is desired for a rising bee population or for additional space to store honey,. The supers are placed on top of those already in the hive. Click Here! 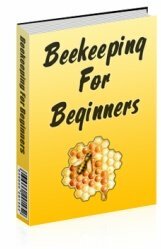 for information about Beekeeping for Beginners. This is a quick download and full of quality information any bee keeper should know.